Green seating plan. Measuring A1 size. 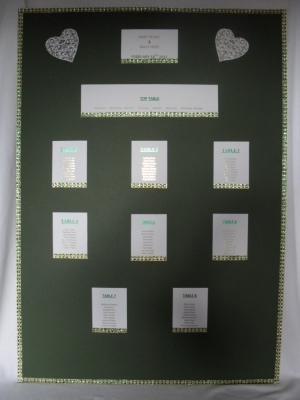 A scrumptious dark green seating plan designed with gold and green foiled writing and finished with green and gold foiled ribbon. 2 gold foiled hearts placed in top corners complete this design. This seating plan can be altered and re-priced to suit your needs.